These pants look good on my son. He’s wears them often. I would purchase again. A Comfortable, Trouser Cut With A Stretchy Waist For Comfort Despite The Slimmer Fit. Great With A Shirt And Jacket For Business Look, Or A Knit And Pair Of Sneakers For A More Casual Look. The pants seemed to run a bit smaller than one might wear therefore I am going to need to exchange these for a larger size. With that said, my son is generally a 34/32 without fail. The material was soft and the fabric was light. These pants seem to be able to be worn year round. Because of the fabric being light they have a feel as if they were cheap, but like I said they are more light and more of a year-round pant than a cheaply made product. 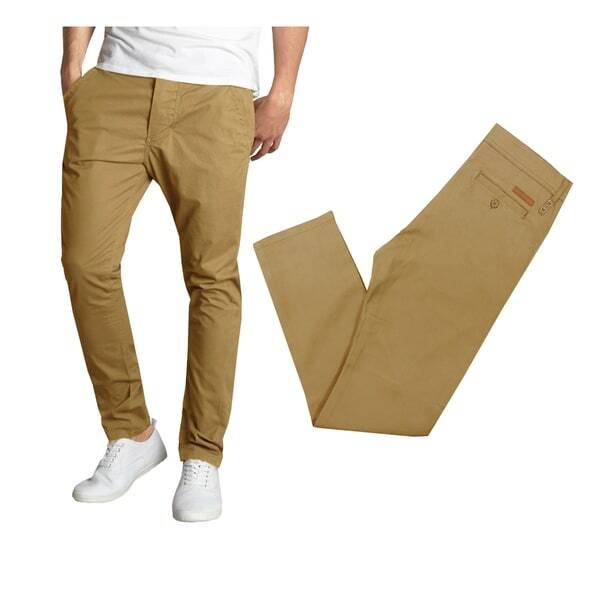 These Chino pants are so classy! You can dress it up with a nice dress shirt or casual with a tshirt and both looks will make you look super clean. I ordered the khaki and the black for my son and he loves them both. They fit perfectly. I bought these for my grandson for Christmas. He loves them. Says they are very comfortable and he wants more of them in other colors. Good fit- very nice material. These are very stylish. Bought them as school uniform pants. They do run small through the legs which was fine for my son. The waist is a true 32 though. My husband loves these pants!! Super stretchy and fashion forward. Great for an evening out. Looks like girl pants.not recommend. Shopping for my husband Christmas gifts and like the look and style of the product...I will be sure to comment on his likes and dislikes of the product when he receive them. My son loves this style!